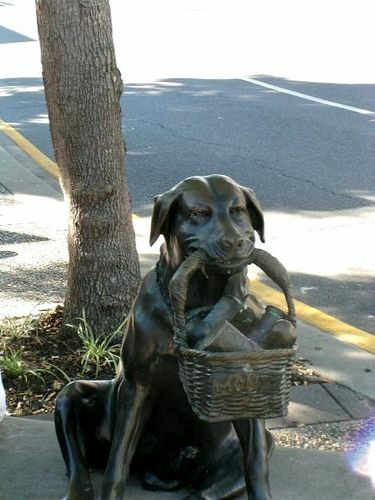 Statue, paid for by the local community, to Monty the black Labrador who frequented the shopping centre with his owner. The dog carried his purchases and lead in a cane basket. Monty’s owner was a nurse up at the Hospital, working late shifts and sleeping odd hours, as nurses do. Man and dog were a well known and popular sight down at the shops, as Monty liked to help by carrying the shopping basket in his mouth and as Monty was an intelligent beast, his owner would often send him down there by himself with the basket and a shopping list. The shop owners would fill out the order and Monty would dutifully carry the groceries back home. As Monty was a sociable and independent dog, he also took to visiting his human friends down at the shops when his owner was at work. Everyone in the area knew Monty and his basket. Shopkeepers, old people, little kids. They all loved him. Monty’s local fame was such that he even appeared in the local paper. and he goes to work in a regional hospital in a small country town.